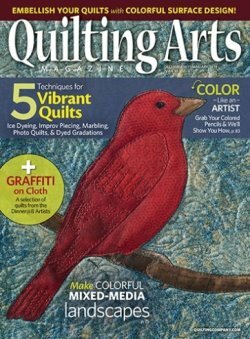 This issue of Quilting Arts Magazine focuses on using colour to its best advantage by creating interesting combinations of hues through dyeing, piecing, patterning, and playing with cloth. Make a choice to move your artistry to the next level by embracing bold and beautiful colours! Learn the backstory of how artist Maria Shell developed her strong voice with improvisational piecing. Capture the joy of exuberant shibori dyeing with Cindy Lohbeck. Learn about marbling, using coloured pencils to enhance your artwork, and so much more. This issue has something that will challenge every fiber artist to push their personal colour palette in new directions.